The Air Conditioning System – how does it work? For those who like to know the technical detail, there are basically two types of air conditioning used in vehicles. The "Expansion Valve System" and "The Fixed Orifice Tube System". The diagram below shows how a typical system works. This air conditioning system consists of four main components. 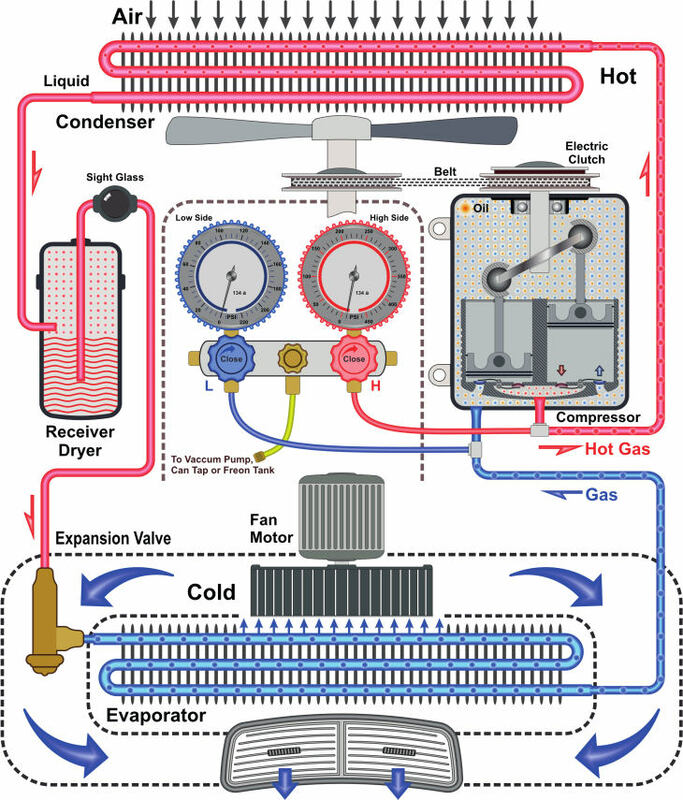 Compressor, condenser, receiver drier and the evaporator. They are connected together with pipes and hoses which split into two sides (High and Low Pressure). The compressor draws in refrigerant gas (vapour) and compresses the gas raising its temperature and pressure. The refrigerant gas is then pumped to the condenser. As this high pressure gas travels through the condenser it is cooled and changes state from a high pressure / high temperature gas into a high pressure / high temperature liquid. The liquid refrigerant passes through the receiver drier where any debris is filtered and any moisture is absorbed. This high pressure liquid now meets the expansion valve where a small variable orifice provides a restriction against which the compressor pushes. The compressor pulls the hot, high pressure liquid through the TX valve and the drop in pressure causes the liquid to cool. The cooled liquid refrigerant travels through the evaporator where heat from the inside of the vehicle is blown over the evaporator fins surface and then absorbed into the cold refrigerant. Therefore cooling the inside of the vehicle by removing the hot air. Cold air is blown out into the vehicle through the air vents. This cycle starts over again as the liquid refrigerant changes state to refrigerant gas and is once again drawn through the compressor. The fixed orifice system uses the same principles but with slightly different components. The expansion valve is replaced with a fixed orifice tube and an accumulator is used instead of the receiver drier.